Our customers can avail from us Rubber Bellow Seals that are the type of heavy duty mechanical seals. These are designed and balanced independent in direction of shaft rotation. We are offering a wide range of Rubber Bellow Seals to our honored customers. Our products are manufactured under the supervision of an expert team in compliance with the industry set parameters, these mechanical seals are highly demanded in cosmetic, dairy and beverage companies. Offered spring seals are acknowledged for smooth installation, dimensional accuracy and longer service life. 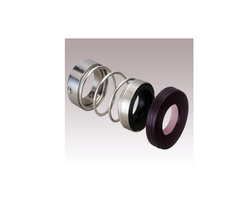 We are the engaged manufacturer and supplier of wide range of Rubber Bellow Seals. Our products are highly appreciated by clients. These mechanical seals are manufactured from good quality silicon carbide, carbon, ceramic, tungsten carbide and satellite. Offered seals are used for mechanical sealing in heavy duty machines and demanded in refinery, cosmetic and beverage industries. The seals we offer are highly resistant to heat and chemicals. Looking for Rubber Bellow Seals ?